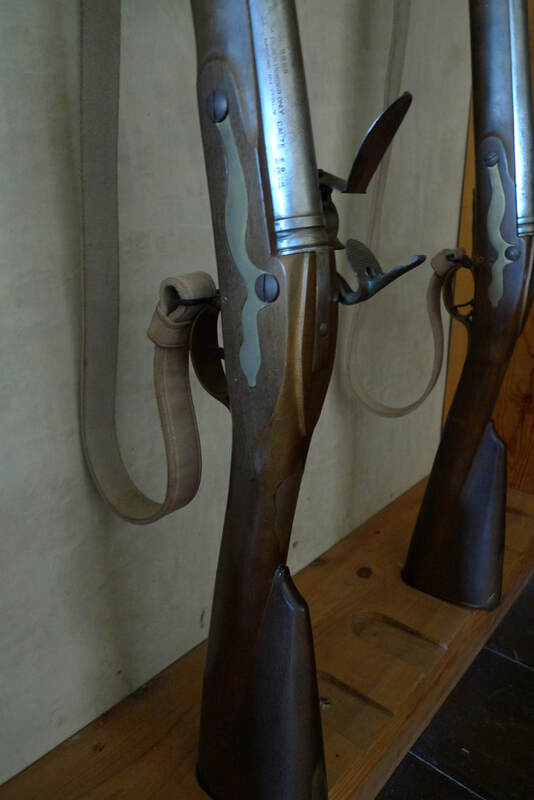 Your whole body is shaking with fear, but you focus on holding the musket dead straight. Every shot must count. You look across at your fellow soldiers in their red coats. They are all aiming their muskets through the firing holes. The sweat is pouring from their brows. Everyone knows that the garrison is outnumbered and about to be charged by hundreds of fierce and screaming Jacobites. Help is days away because of the isolated location among the windy moors and mountains. 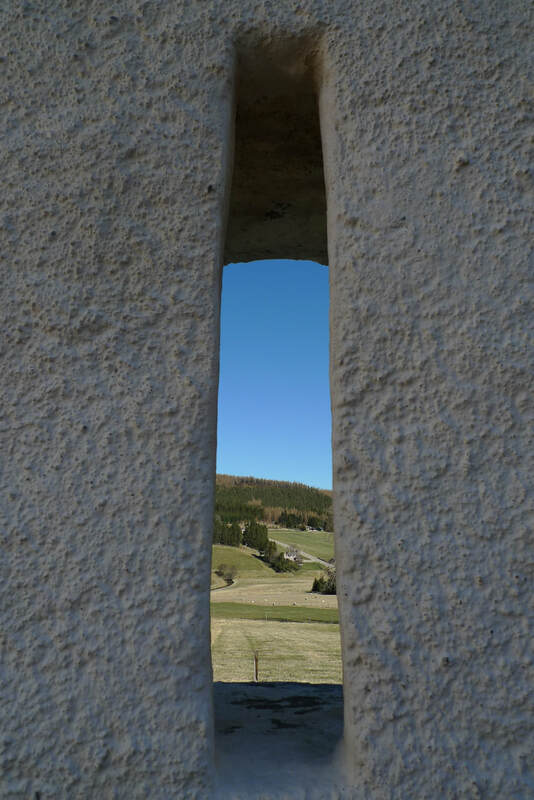 The one thing that is on your side is the star-shaped wall that is designed to make the castle difficult to breach. It's firing holes ensure that each side of the wall is covered by 2 angles of fire. Your weapon is a vital part of that defense. You must not miss. Corgarff Castle certainly captures the imagination. It sits in a remote location; a speak of white, unbelievably bright white, among barren mountains. Its star shaped perimeter wall, with gun slits, evokes war movies where desperate soldiers hold out against overwhelming odds. I will always remember that day in some gift shop where I spied a postcard of this lonely castle and was immediately inspired to go there. You would hope that the journey to such an evocative place would be suitably dramatic and I can tell you that it exceeded my expectations. I left Ballater on a steep uphill, hemmed in by thick forest, the River Dee running below and a scent of wood and fern. For some reason it sparked memories of time that I spent in the Canadian Rockies. The A939 is tough with lots of hills, so there was plenty of standing on the pedals to get the bike to the top. These climbs were followed by gloriously speedy downhills where Heather scent blew up my nose. This route was originally a military road, built in the eighteenth century so that troops could keep order in rebellious parts of the country. One of its legacies is a hump-backed bridge at Gairnsheil. It is so picturesque that it halted me in my tracks. I peered over the edge and was astonished at how see-through clear the water was. A little further and I passed a ruined house with no roof and crumbling walls. Despite the rather obvious structural failings I was astonished to see that there was still an iron bedstead amidst the destruction. I trampled down to take a closer look. It was jammed against a window, its glass and frame long gone, but still looking onto a spectacular vista. I wondered how long ago it was that a person routinely awoke in this bed to see the sun rising over these hills. One of the most memorable parts of this ride happened during one of those adrenaline inducing downhills; a kaleidoscope of colours exploded before my eyes. The hills were patterned with greens, browns, yellows and pinks. It was an incredible scene and one that I wished never to forget. At one point I was joined by another cyclist on his way home to Aviemore. He had been in Ballater for a wedding with his family. "I saw that the weather was going to be nice so I put the bike on the car, so that I could cycle home." I liked his style; always looking for an opportunity to get a ride in. I negotiating the rough track, covered in sheep droppings, to the entrance. 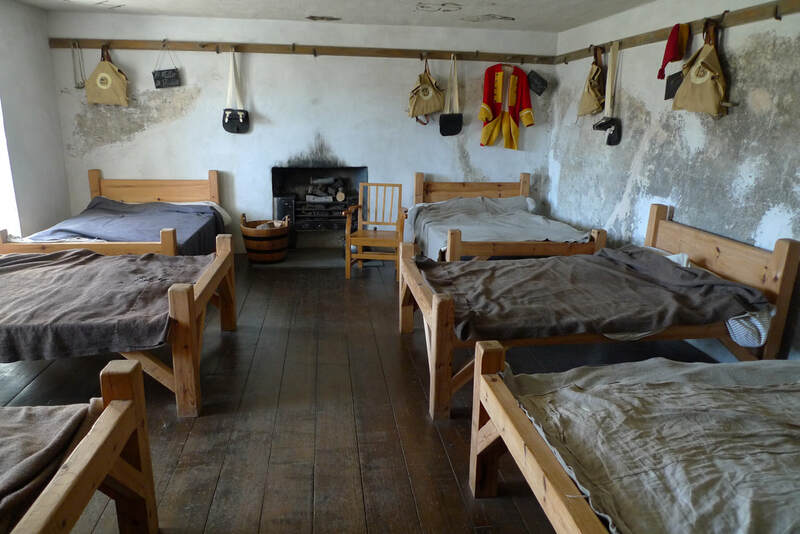 It only takes about 30 minutes to look around the interior, but it perfectly captures the atmosphere of isolation that the Red Coat soldiers must have experienced. This was particularly apparent in one of the dorms where the troops had slept two to a bed and all I could hear was a fly buzzing across a window pane and the window frames rattling from gusts of wind sweeping across moors and hills. A couple of miles from the castle is Goodbrand and Ross, a brilliant cafe and gift shop inside a wooden chalet. The veranda was a great place to enjoy a coffee in the sunshine. The home baking and ice cream parlour was making this a popular spot with cyclists. There were loads of them, but when I overhead their conversations I discovered these were serious road cyclists. They did not talk of the landscapes, the castle or the beauty, but of distances that they had covered and the speeds that they had reached. I was not going to have anything to talk to them about, so I pushed back to Ballater. The oil business was the topic of conversation from a local guy man waiting for a table. He told me about a friend who invented things for the industry, including something that made £100 million. "He just keeps thinking about ideas, got one on the go now. I'll nae tell you anythin' aboot it tho. It's probably confidential." After a delicious chicken tikka masala I cycled into Glen Muick. The light was golden and I delighted in the pine scent from the thick forest. I noticed a path heading into the trees that was just crying out to be explored. I dismounted and made my way through the springy moss and arrived at a plunging waterfall. The River Muick was throwing up a cloud of spray and producing a sound that instantly made me feel relaxed. I sat down and marveled at the fact that I had this to myself. There was nobody around. It was 6.30pm and everyone else was likely at home, eating dinner. I had chosen the right time to come here. The route into the glen became wilder with moors and hills. Lochnager, the 1155 meter high mountain, came into view and it had a topping of snow. I arrived at Loch Muick, framed with dramatic mountains, where Queen Victoria liked to go fishing. I was too busy admiring the loch that I didn't notice I was being watched. It was only when I turned around to go that I noticed them. ​Deer. The hillside behind me was covered in them. I understood now that their red fur was the perfect colour, as they blended in to this landscape so well that I had failed to spot them at first. They just stood and watched me. I watched them back. There were stags among them with their impressive plumage of antlers. It felt so special to have this scene before me, like a widescreen presentation of a wildlife documentary. Could there be a more perfect ending to a Scottish cycling trip? 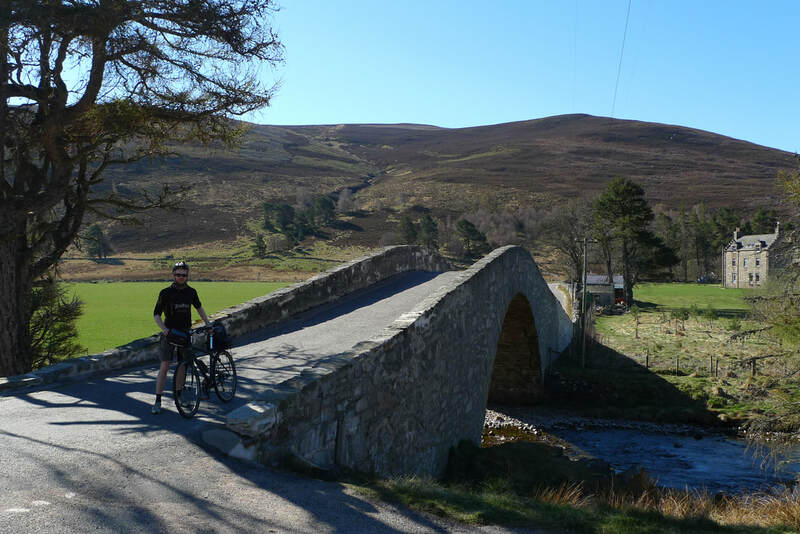 Following this journey requires a total of 54 miles of cycling to include the return to Ballater. 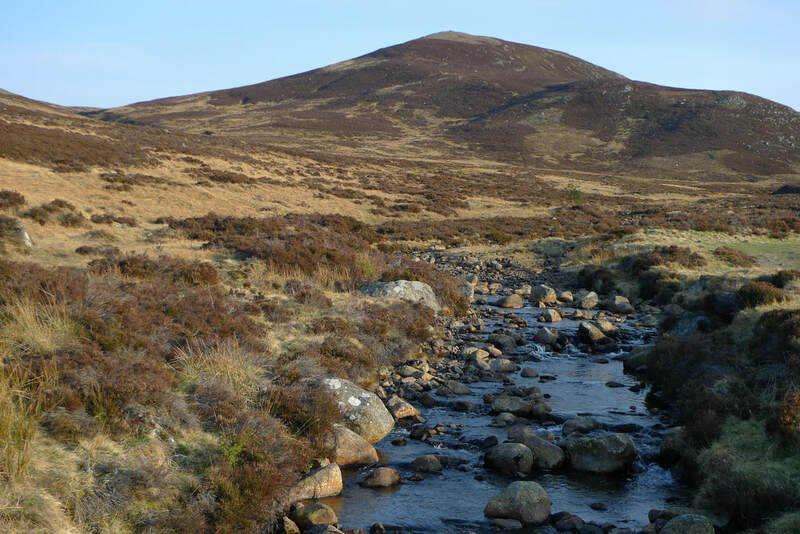 It is about 16 miles from Ballater to Corgarff Castle. There are many steep hills on this route, so you will need a good level of fitness. It is a main road, but it doesn't get much traffic. 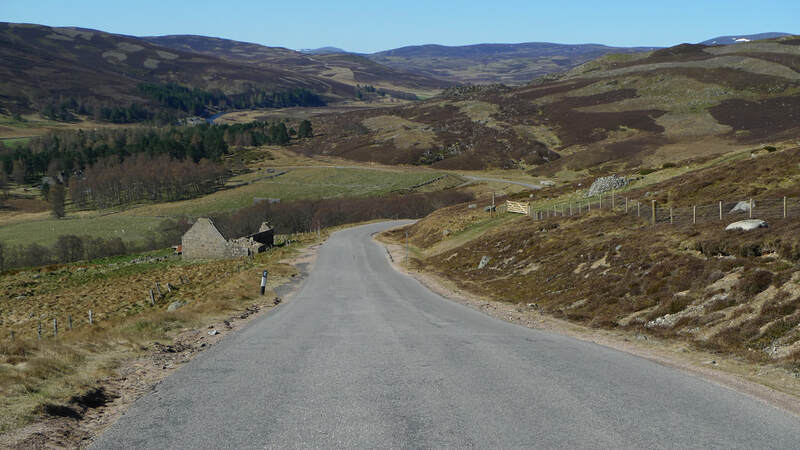 From Ballater to Loch Muick is 11 miles and this road also has some hilly sections. Glen Muick is a popular place so the road can be busy, but if you go, like me, in the early evening you will find it much quieter. 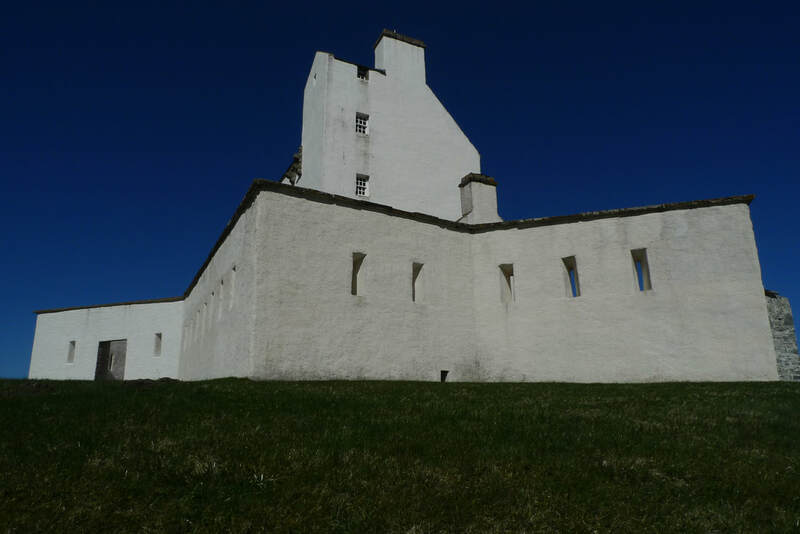 Corgarff Castle has paid admission. ​I stayed in Osbourne House Bed and Breakfast, one of the most distinctive buildings in Ballater. It has a traditional decor with lots of interesting ornaments. The lounge, with its ticking clock, is a tranquil place to spend a few hours in the evening. My breakfast of porridge with cream followed by smoked salmon and scrambled eggs was perfection. 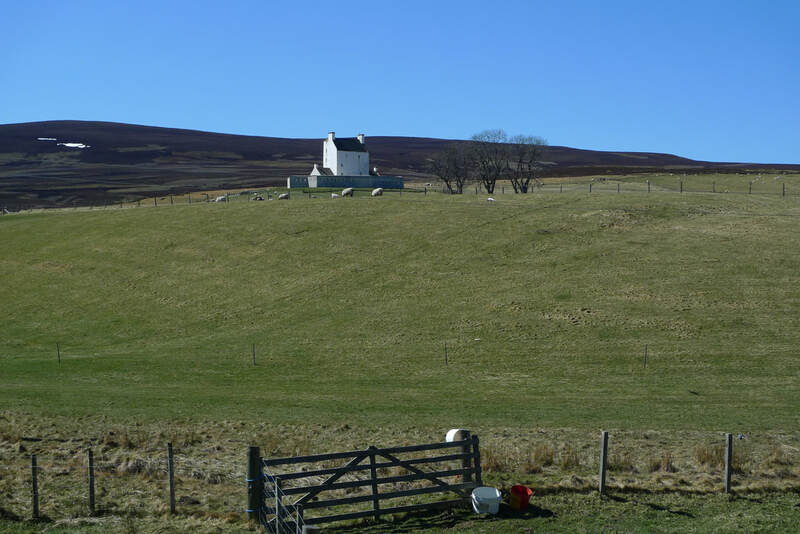 Goodbrand and Ross is near Corgarff Castle and offers great home baking, ice cream and coffee.